The government’s response comes after Washington state and Minnesota obtained an emergency temporary restraining order Friday that halted implementation of President Trump’s controversial travel ban on citizens from seven predominantly Muslim nations. The Trump administration has asked the 9th Circuit Court of Appeals to reinstate its controversial ban on immigrants from seven mostly Muslim countries and on all refugees, arguing a Seattle judge exceeded his authority by issuing a nationwide injunction. The administration contends that Trump was well within his authority when he issued the executive order last month, citing national security. Department of Justice lawyers, in a 20-page brief, deny the president’s order is religious based. It states that three of the countries — Iran, Sudan and Syria — have been determined by Congress or previous administrations to be state sponsors of terrorism, and four others — Libya, Somalia, Iraq and Yemen — provide a safe haven for terrorists or represent a heightened risk of terrorism. The appeal is being considered by a panel of three 9th Circuit judges based in Phoenix, Honolulu and the Bay Area, according to the court’s website. Oral arguments are set for 3 p.m. PST Tuesday. Assistant 9th Circuit Court Executive David Madden said that the arguments will be live-streamed on the court’s website: https://www.ca9.uscourts.gov. The losing side will have the choice of asking for a rehearing before the three-judge panel, seeking a hearing before a larger “en banc” panel of at least 11 judges, or taking the decision straight to the U.S. Supreme Court, he said. 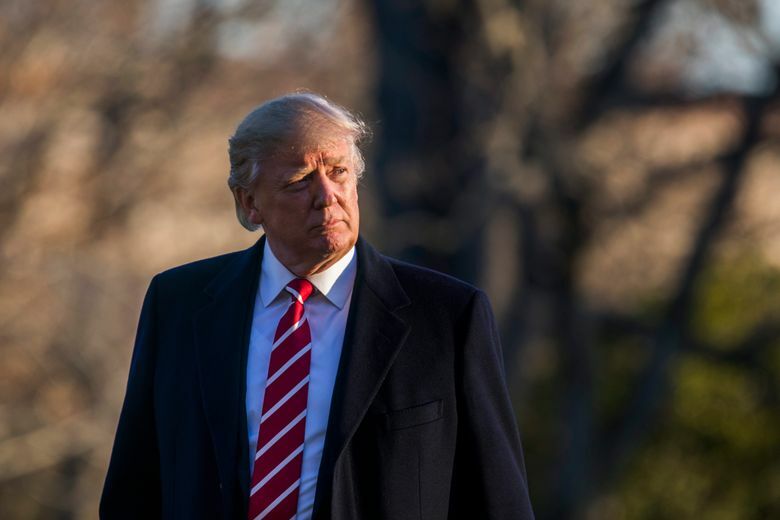 The government’s response was filed Monday afternoon after the states of Washington and Minnesota obtained an emergency temporary restraining order on Friday from Seattle U.S. District Judge James Robart, halting implementation of Trump’s Jan. 27 executive order. Trump’s order indefinitely blocked entry to the U.S. for Syrian refugees and temporarily suspended entry for refugees and travelers from the seven majority-Muslim countries. Those countries are associated with a “heightened risk of terrorism,” the Department of Justice lawyers argued. “Here, the state asks the courts to take the extraordinary step of second-guessing a formal national-security judgment made by the President himself,” administration lawyers wrote. 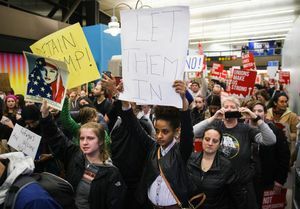 The executive order unleashed chaos at airports and elsewhere as thousands of immigrants, many of whom had already been screened by immigration officials and issued visas, found themselves banned from entering the country. Protests sprang up at numerous airports, including Seattle-Tacoma International Airport, as families were separated and some traveling immigrants were put back on airplanes and ordered out of the country. Justice Department lawyers filed an emergency appeal of the judge’s order Saturday to the 9th Circuit, which is headquartered in San Francisco. A three-judge panel there refused to lift Robart’s temporary order and set up an aggressive briefing schedule. Washington Attorney General Bob Ferguson argued that reinstating the ban would again “unleash chaos” around the country. He argued that Trump’s executive order is a thinly disguised effort by the president to fulfill a campaign promise to ban Muslims from coming to the U.S. The state argued that a ban based on a religious litmus test would violate the Establishment Clause of the Constitution preventing the government from endorsing or discriminating against one religion over another. The government maintains that the president alone has the power to decide who can enter or stay in the U.S. Meantime, more than 100 technology companies, leading civil-liberties and immigrant-rights groups, 16 other state attorneys general and 10 former foreign-policy officials — including two former secretaries of state, Madeleine Albright and John Kerry — have lent their opposition to the Trump travel ban in amicus “friend of the court” pleadings. They said Trump’s ban would disrupt lives and cripple U.S. counterterrorism partnerships around the world. “It will aid ISIL’s [the Islamic State group’s] propaganda effort and serve its recruitment message by feeding into the narrative that the United States is at war with Islam,” according to the six-page declaration filed in court. The single amicus brief supporting the ban came from nonprofit conservative groups, including the U.S. Justice Foundation, Citizens United Foundation, English First Foundation, Public Advocate of the United States, Gun Owners Foundation, Gun Owners of America, the conservative Legal Defense and Education Fund, U.S. Border Control Foundation and Policy Analysis Center. Mike Carter: mcarter@seattletimes.com or 206-464-3706. Information from Seattle Times archives and The Associated Press is included in this story.